UPDATE #19: 3 Days Left!!! Backers Will Get Access To Our Many Builds Through Unity's Webplayer! Click here to try it out! All stretch goals completed! Thank you everyone for your support! But this is causing an imbalance on the island, causing monsters to appear out of nowhere and sapping the town's resources. Since Esmy (the nickname she prefers to be called) is passionate and a good candidate for Cryamore research, she's commissioned by the Town Council Chief to search for alternate Cryamore resources, which spirals into a much more ominous dilemma. This is an action-adventure game (with a few role playing elements), to be released on Windows, Mac, Linux, iOS, and Android! It takes the best facets out of yesteryear's gaming, like inventive puzzles, well-balanced action gameplay, quirky story, hand-drawn backgrounds, and gorgeous pixel art, and blends it in not only just one yummy nostalgia cake, but a classically fresh take on the genre. Imagine the barebones gameplay of Zelda, mixed with atmospheric elements from Metroid, action done in the style of Secret of Mana, the excitement of figuring out what element to use like Megaman, hand-drawn storybook backdrops like Legend of Mana, with comedic tones and a thriving in-game clock system like Brave Fencer Musashi; that's Cryamore in a nutshell. For more information on the game's influences, visit here! Cryamore is being whipped up by a small handful of oversized kids who grew up playing their SNES'es, PSXs, and N64s at nearly every waking moment! Let us introduce ourselves! Rob Porter is currently a mercenary illustrator, character & game designer, and comic artist in Chicago, IL, drawing stuff for UDON Entertainment (Capcom, Namco-Bandai) on the side as well as a small handful of other gigs. He also had the privilege of doing clean-up animation for the popular Indie game Skullgirls. In addition, he's starting the independent game studio NostalgiCO with his partner Alan. Alan Wansom is a programmer, game designer, artist, video editor, hailing from Canton, Michigan. He was working on his own project known as 8-Bit Bastards before Rob responded to his reply about putting their heads together and actually making an actual effort for a commercial game. Yes, you've clicked on the link for 8-BB, and we know you think it looks awesome. That's next if Cryamore pulls it off! Aivi Tran is the critically acclaimed "VG Piano Princess" of the group (translation: composer), known as "Waltzforluma" amongst her other channels on her Youtube and Twitter. She particularly grew up adoring the works of Yasunori Mitsuda (Chrono Trigger), Koji Kondo (Zelda), Akifumi Tada (Bomberman 64), Michiru Oshima (Legend of Legaia), and you can hear it in her work; but she adds her own playful, personal touch to it. So you know that Cryamore’s music is in good hands. Steven "Surasshu" Velema is one-half of the awesome Yogurtbox duo, and he will be mainly manning the sound design in Cryamore; having worked for Amaze Entertainment, Capcom, EA, WayForward and more. He's also an exceptional composer/arranger (he scored the Kickstarter pitch video! ), and he will be helping Aivi on some of the soundtrack. Kouki Hirotani, known simply as KOKI, is an experienced pixel animator and artist for 7th Chord (Tales of Innocence:R; Namco-Bandai subsidiary), and he worked on the Japanese Kamen Rider DS games as a clean-up animator. His classic, fluid animation style is just what you were looking for in games like these. Ryan Koons, a former Insomniac (of Ratchet and Clank fame) programmer and solo game developer, joined our team here at NostalgiCO for the long haul as a Lead Programmer. He was one of the very few programmers on Insomniac's recent social RPG Outernauts. You can also check out his fun, smaller-scale title Stardrops. Mariel Cartwright, often goes simply by Kinuko, is a freelance artist, character designer, and animator; working for WayForward and Konami. She's best known from her gig as the Lead Animator of Skullgirls and working on Scott Pilgrim: The Game (Ubisoft). Her unique animation sense will provide slick action and fluid movements. Also, she really loves monsters and designing characters. Jordan Chewning, the tour de force behind the art of 2-man Indie developer Twindrills, is an animator, programmer, and pixel artist. He's best known for working on the indie game Zombie Grinder. He loves working with snazzy, particle effects too. Brandon Cullis, a professional software engineer by day & game dev by night, is also jumping in the fray. He's working on this huge C#/XNA Level Editor at the moment, but he's going to take some time out to be an Assistant Programmer, help managing a lot of the scripting. Cryamore will feature a rich, single-player experience, mixing exploration and puzzle solving with strategic, action-based gameplay. There will be little to no handholding. We're not big on the westernized, "accept or decline quest log"-based systems many modern Action-RPGs employ, we want the player to discover things for him/herself. Just like the 80s and 90s. The gameplay will be strongly Ability-based on varying elements. Players can use some of the abilities in battle, but will mainly have to use these abilities to advance through the game. Seems like the wisest solution above, yeah? Well, there are 80 other abilities that need to be utilized to get past certain points; higher-level puzzles requiring you to think outside the box. Just as Link needs Pegasus Boots to knock the Book of Mudora off the top of a shelf, or Samus her Speed Booster to charge through previously inaccessible walls and areas, each element will have various types of abilities for Esmy to figure out which one will do the job for the situation. She can even link up certain abilities to maximize potential. Some will have additional attributes for fighting specific elemental enemies, and there are 81 of these different abilities... Even summons. The Butcherknife will provide balanced gameplay, while the Javelink adds concentrated precision to your attacks. The Pizzaxe is a power-heavy weapon, and the Megadart yields range to your combat. Real-time combat system using a combination of player's preferred weaponry and elemental abilities of which can also be used for contextual exploration! Even specific Weapon Special attacks to learn! 81 different elemental abilities spanning over 9 different elements! A variety of monsters to find and record in your bestiary, some needing elemental combinations to defeat! Time is a key component to the game, as the game will have an internal clock. Shops will close at specific times, rare monsters will appear at different times, and even in order to solve some puzzles will require being at specific times in the day to figure out. Esmy can even get tired or alter time with the Time Element! Puzzles that will utilize specific Elements in order to figure out, as well as your brain! A hearty assortment of special items to collect, like action figures, food and ingredients, weapon skill scrolls, stat increasers, and more! Full-fledged side-quests, including repairing a town back to a full-functional state, unlocking other stores and venues in the process! Summon assists that will actually play a huge role in the tale! A carefully interwoven story that allows the player to discover things piece-by-piece, all while still having strong character development! Gorgeous, (HUGE! ), fluidly animated, pixel-based sprites. Every spot in the game will be uniquely hand-drawn, specific to the area! For more information on the game mechanics, visit here! We want to make Cryamore's story be an engaging experience, specifically one where the player will make discoveries on their own and piece things together, and we're fans of unexpected plot twists! Having great professional editors to go to for help on call will ensure that we make Cryamore's story a unique experience. A lot of inspiration we borrow from when it comes to thematics are Fullmetal Alchemist, Final Fantasy 6, Terranigma, and Chrono Trigger. Read up on the character bios on our site to get a feel for what you'll be getting yourself into! Work-In-Progress of Noka Island, where Esmy's adventure takes place. When it comes to the Art Direction for Cryamore, we're inspired by the art from games like La Pucelle, the Wild Arms series, Lime Odyssey, and Atelier Iris. We feel that for a game like this (and games in general), art should be a HUGE part of it and will give something a bit more extra special in addition to just "playing the game". We're gamers first, and artists second. So we are shooting for a great visual experience to accompany great gameplay. Once upon a time, after we would get done with a session of playing the games of yesteryear, we would thumb through the instruction booklets and just gaze at the character art and do our own lil' doodles of them. We want to invoke that sense of passion with Cryamore. From the character art, to the in-game art, we want to cover all of our ground. We are drawing practically everything. Each area will be unique, colorful, & lively, having animated aspects to them. You can find more related art on Creative Uncut! We picked Aivi out of the many wonderful composers existing today because she has that unique style of composition from games that are now hard to come by these days. Press Play and tell us what you think! Be sure to click her SoundCloud page for examples of the rest of her work! If you enjoyed the voice acting on the video, you'll be happy to know that they were voiced by professionally talented voice actresses, with the help and direction of Chris Niosi! Up-and-coming Erica Mendez voices Esmy; she's currently known for her work as Corbin in Dust: An Elysian Tail. Marianne Miller voices Braxton; she worked on Fullmetal Alchemist, Avalon Code as Anwar, and Puella Magi Madoka Magica as Kyosuke Kamijo. Kimlinh Tran voices Bliss; she's most popular for voicing Fidget in Dust: An Elysian Tail and Ms. Fortune in Skullgirls. 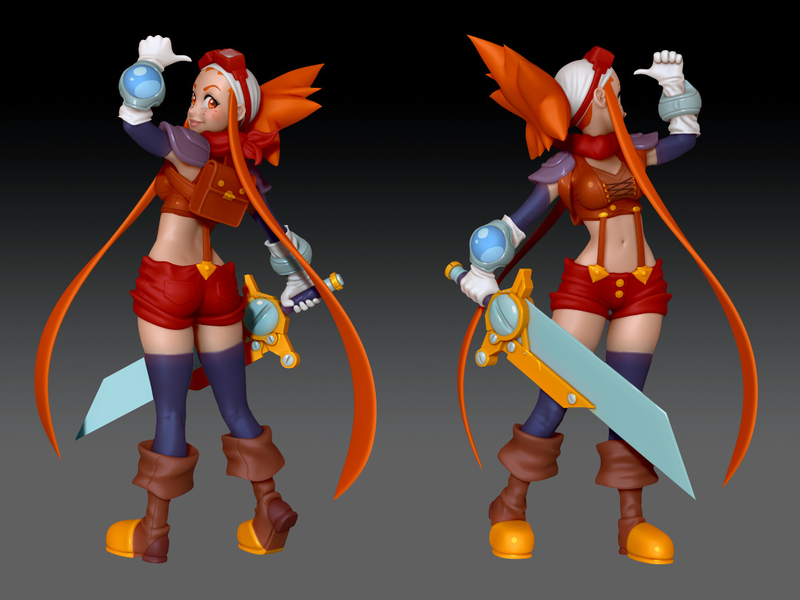 We have some great rewards available for those who will help us make Cryamore happen! Esmy already prepared all the research materials and summarized it just for you, so just read below! For the art appreciators! We'll land these backers the digital copy of the game + over 20 Backer-Only, Exclusive High-Resolution (and we mean HIGH) Wallpapers! For the music lovers! We'll land these backers the digital copy of the game + over 20 High Resolution Wallpapers + Digital Version of the game's 40+ song soundtrack, composed by the charming Aivi Tran! For those who want Esmy immortalized on top of their furniture! This will get you a digital copy of the game + 10-inch (originally 9-inch), Resin-casted figure of the smart Esmyrelda Maximus, pre-painted or not by request! So she will stand proud and prestigious on your gaming station or computer desk, cheering you on while you find all the Cryamore! $250 Reward: MASTER CRYATIST'S PLEDGE! It's a Limited KICKSTARTER-ONLY Cryamore-Yellow, Physical version of the game on DVD, with a 20-page, full-color instruction booklet to boot. There will only be a thousand of these made, with an additional special message in each one, just to show how much we love you. Quick important note: the pledges before this reward was introduced DO NOT include the physical version. You would have to choose the direct pledge that has a physical version on it. These pledges are the STEAM PUNK'S PLEDGE, PHYSICALIST'S PLEDGE (Physicalist's Pledge does not include figures), and LEGENDARY CRYATIST'S PLEDGE. We really want to make this game happen, that's why! But it's difficult to do so when we can only devote spare time to it. So far, we've been placing all of our spare time and money into Cryamore ourselves; we're getting good vibes about investing all of our effort into this game. Kickstarter is a valuable tool into helping us reach our goal, and to involve YOU and give YOU a great game! Now that we hit our base goal of $60,000, we have stretch goals prepared to help make Cryamore a completely polished game. With your help, we can really make the following features a reality! Here are the goodies to look forward to! Funding past our highest stretch goal will go towards more assistance and getting the game out to more people's hands! We're a very talkative bunch of people here. So if you have a question, chances are we most definitely will have an answer! So ask them! We will do our best to answer them quickly. We will also update frequently here on Kickstarter! You can also follow us (or, Esmy) on our Twitter @Cryamore and like us on Facebook! This is of course a 5-man team at best. This will be our first commercial game undertaking, and though we have made many small games before for fun, everyone involved have been employed in the gaming industry and digital media. Though with any project (especially game development, even more so with a game like ours), we are bound to run across some snags. The first challenge: Since we're not utilizing tile-sets (compared to a game of this nature where such assets can be reused), we will be painstakingly hand-drawing and painting EACH 2D background. There will be a LOT of art content. We feel this will make Cryamore special, as each specific spot in the game will BE unique. We have a strong artistic work ethic to make it work due to what we do for a living, and with enough financial backing, can hire the help needed to get it done more efficiently. Sprite & animation work can also be a potential challenge, as there is a considerable amount of animations for Esmy and quite a handful of simpler unique NPCs/Monsters. Koki & Kinuko's background will ensure that we can accomplish this, as well as Alan, Rob, and Jordan to back them up. Now that we have dedicated programmers (Ryan & Brandon), coding is definitely not an issue. And again, we can always pull on more help if needed and if we get enough financial assistance. Music is covered. Sound is covered. The only risk is development time, but with having the ability to keep consistent and steady updates on Kickstarter, we will ensure that all involved will be kept abreast of what's going on. We will also have Live Development Streams so you can be in on the growth. You can check our track record on our devblog! We update rather frequently. The fact that we're sticking with somewhat old-school limitations utilizing modern-day potential gives us even more impetus to finish the game. Since June 2012, we have been investing all our spare time and money into developing Cryamore while carrying full-time jobs. This is definitely a passion project, and we are confident and committed to ensuring this game becomes a reality (although MUCH slower without help). So we would definitely appreciate any help we receive! Thanks for checking out our Kickstarter page! PREEMPTIVE ATTACK: First 500 backers will reserve a Digital Download of the game, Cryamore for $10! (Suggested retail price is $20) And a big, hearty thanks from us for your support! ELEMENTALIST'S PLEDGE: It's Elementary... This will fetch you a reserve for the Digital Download of the game, Cryamore! (Suggested retail price is $20) And a big, hearty thanks from us for your support! ARTISAN'S PLEDGE: A Digital Download of the game! PLUS over 20 Backer-Only High-Resolution Wallpapers for you featuring characters, locales, and more! INSTRUMENTALIST'S PLEDGE: You get the Digital Download of the game, PC or Mac, the wallpaper pack, and a digital copy of the 40+ song Soundtrack by the clever Aivi Tran! ADVENTURER'S PLEDGE: You get all previous Rewards, PLUS a Limited Kickstarter Exclusive World Map Poster of Noka Island, where our adventure takes place! MASTER CRYATIST'S PLEDGE: You get all previous Rewards (not including Tailor's Pledge), PLUS BOTH Limited Kickstarter Exclusive 9-inch, Resin-casted figurines of Esmy and Bliss, sculpted by the fine folks at Gensen Figure! BEST-valued pledge offer! CREEPER'S PLEDGE: You get ALL previous Rewards, PLUS Design your own rare elemental monster with a basic attack, and we'll add it in game! Also, bragging rights in the credits. EGOTIST'S PLEDGE: You get ALL previous Rewards (not including Creeper's Pledge), PLUS yourself or original character as an NPC that actually lives in Ghilcrest, you self-obsessed person, you! Also, bragging rights in the credits.